Your roof is your home’s best protection against the damaging weather that occurs during monsoon season. Is your roof ready for the challenge it is about to face? 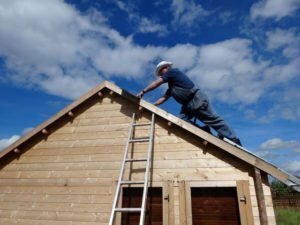 These tips will help you get your roof in monsoon-ready condition and quickly have it repaired if damage occurs. All of these problems can be solved before your home suffers damage from the Arizona monsoons. In addition, the brutal Arizona sun and heat cause all types of roofing material to age quickly, and when it does, it is susceptible to damage from monsoon winds and rain. If your roof is more than ten years old, having it inspected and repaired prior to monsoon season is preventative home maintenance that makes sense. Also, inspect the attic and the ceilings on the top level of your home for signs of water penetration through the roof. While inspection from the ground can show obvious damage and it is safer than getting onto the roof yourself, you might miss damage that hard to see. If your neighbors are reporting damage to their roofs or you suspect your roof might need repair, don’t hesitate to call a roof repair company in Phoenix or your local town. Of course, if you find any sign of damage, contact a Phoenix roofing contractor immediately. The roof repair specialist will bring ladders and equipment to properly inspect your roof for damage. In the short-term, tarps might be placed over areas where shingles are missing to prevent further damage and water penetration. Roof repair in Phoenix, AZ during monsoon season should be done promptly. Minor damage can be repaired by replacing just a few shingles. Repairing major damage can involve tearing off the old roofing materials and installing a new roof. The advantages of a new roof include better protection from the elements, improved appearance and the peace of mind that comes with a new roof warranty. In some cases, the installation of a new roof can lead to lower home insurance costs. Contact your agent for details. The longer your roof goes without being repaired, the greater the damage can be to the roof, house structure and eventually to the interior of your home. Don’t delay. Call today for roof inspection and repair in Phoenix and the surrounding areas that will keep your home safe and healthy for you and your family.